The destiny of the Turku shipyard, once Wärtsilä Marine, then Masa-Yards, then Kvaerner Masa-Yards, then Aker Yards Oy, and now STX Finland Oy, is about to be determined by an offer from Meyer Werft to take a 70% shareholding, alongside the Finnish government. Coincidental with this announcement comes an order for two 2,500-berth cruise ships from TUI Cruises, with options for two more, that will allow Germany to surpass the UK as the world’s second largest cruise market. From the growing French market comes news that Rivages du Monde is expanding into ocean cruising and has also developed a new St Lawrence program for 2015. Meanwhile, Xiamen Shipbuilding’s plan to build China’s first 100,000-ton cruise ship has disappeared along with that of the Titanic II. Last week it was announced by Germany’s Meyer Werft, a yard that first entered the cruise ship scene in a significant way by building ships for Celebrity Cruises, that it had made an offer to acquire a 70% stake in STX Finland’s Turku shipyard, with the Finnish government taking the other 30%. Another branch of Royal Caribbean Cruises, half-owned TUI Cruises, has helped this agreement along by ordering two more newbuildings, Mein Schiff 5 and Mein Schiff 6, for delivery in 2016 and 2017, with options for two more. 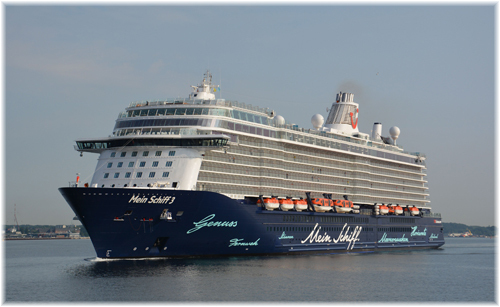 Mein Schiff 4, the second of now four, potentially six, 2,500-berth newbuildings, is due for delivery in 2015. It would have been the yard’s last cruise ship had it not been for the latest TUI orders. Meyer Werft at 70% and the Finnish government at 30% will take the shareholdings in Turku in an agreement with STX Europe, present owner of the yard. Subject to approval by anti-trust authorities and the banks, STX Finland Oy will become Meyer Turku Shipyard Oy. The deal ensures that TUI Cruises will keep the valuable know-how of the Turku shipyard and will also allow TUI Cruises to expand on its own schedule to a fleet of eight ships. TUI Cruises as a joint venture between Royal Caribbean Cruises and TUI AG, is part of the Royal Caribbean empire that has ordered so many of its ships from yards in Germany and Finland, while Carnival Corp & plc has been a major supporter of the Fincantieri Group in Italy. 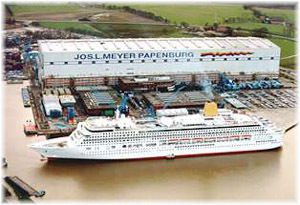 The acquisition of the Turku yard will add to the Meyer yards in Papenburg and Rostock, which builds river cruisers. It will give Meyer more flexibility and the ability to build cruise ships well above the “Papenburg-max” size they are now restricted to by the limitations of the Ems River, on which its main yard is located. The sale of STX Finland has been expected since October after South Korea’s troubled STX Group confirmed the plan to sell STX Europe, which included both the STX Finland and STX France shipyards. The STX Group acquired Aker Yards, in 2008, a year in which the group delivered nine cruise ships. Since then, cruise ship orders have slowed due to the recession and STX Group itself was hit by the global slowdown in cargo shipping. Presently-scheduled deliveries at Papenburg include Quantum of the Seas this year, Anthem of the Seas and Norwegian Escape in 2015, Quantum 3 and a 150,000-ton ship for Star Cruises in 2016, another Star Cruises ship and Norwegian Bliss in 2017, and two additional Breakaway-plus newbuildings in 2018 and 2019. The yard’s first cruise ships, Home Lines’ Homeric in 1985 and Royal Cruise Line’s Crown Odyssey in 1988, were followed by five ships for Celebrity Cruises, the first of which were the Horizon of 1990 and Zenith of 1992. The Century, Galaxy and Mercury followed in 1995, 1996 and 1997. All five of the original Celebrity newbuildings are still in service within the Royal Caribbean group, the last two as Mein Schiff 1 and Mein Schiff 2. Horizon, which is approaching twenty-five years of age, Zenith and Century will all soon be sailing under their original names again for Royal Caribbean’s Spanish and French-market affiliate Pullmantur Cruises. 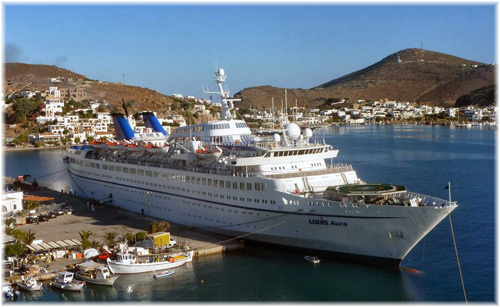 Homeric now sails as Thomson Dream while Crown Odyssey is Fred. Olsen’s Balmoral, both of which have been stretched since their original construction. The delivery of the latest TUI ships will allow Germany to surpass the UK as Europe’s largest cruise market, with six newbuildings adding 15,000 berths to German cruise inventory if the last two options are taken up. At 35 cruises per ship per year, averaging 10 days after dry-docking allowance, this alone would be enough capacity to accommodate more than half a million passengers per year. Founded in 2001 by Alain Souleille, French river cruise operator Rivages du Monde has recently sprung into the limelight, particularly with events that happened this spring, two of them on May 10. It was on that day that Rivages du Monde took delivery at Marseilles of the 600-berth Louis Aura for an 11-cruise 105-day charter from Louis Cruises. This ship operates primarily in the reader offers market, concentrating on attracting groups from advertisements in various French newspapers. Her capacity has been reduced from 828 lower berths to 600 berths on sale and she has been busy carrying French passengers in the Mediterranean and North Europe. The charter of the Louis Aura sprang from Rivages du Monde’s appointment in 2013 as Louis Cruises’ representative in the French market and will bring Rivages du Monde’s ocean cruise numbers to about 6,000 this year. On the river side, on the same day as the Louis Aura went on hire in Marseilles, Alain Souleille announced another inland cruise project in Quebec City, with a new 15/16-cruise 150-day program for the St Lawrence River and Lake Ontario using the 214-berth Saint Laurent, presently known as Sea Voyager, which it will charter from owners in Miami starting in May 2015. This market first came to Souleille’s attention during a Canada New England Cruise Forum held in Quebec. Originally intended as a 150-day program, this was later cut back to 100 days, for about 2,000 passengers. Fares will include scheduled flights from Paris to Montreal and the cruises will leave from Montreal and call at six ports: cruising the Thousand Islands, Kingston, Toronto, Niagara Falls, Ogdensburg NY, Trois-Rivières and Quebec. The US call is necessary to meet Canadian coasting regulations. River cruises now account for about 12,000 passengers at Rivages du Monde, of which 5,000 are for Russian waterways, 3,000 for the Mekong, 2,000 for the Danube, 400 for Burma and 300 for China. If the new St Lawrence plans are successful, this would amount to about a 17% increase in Rivages du Monde’s river business, although it is likely that their Russian business will drop because of events in Ukraine. The St Lawrence would then vie with the Danube for third place. On the ocean cruise side, Rivages du Monde entered into an agreement this spring to take over the operation of the French-based Mediterranean operator TAAJ Croisières, with effect from January 1, 2015. TAAJ had been working for many years with Costa Cruises, using ships such as the 776-berth Costa Marina, 820-berth Costa Allegra and 840-berth Costa Voyager, but this year’s switch to the 1,308-berth Costa Classica proved a switch too far. The much larger ship resulted in Costa booking space that TAAJ Croisières could not fill, but at lower fares, a situation that clearly could not continue. Next year instead, Rivages du Monde, intends to charter the Louis Aura for 210 days during which she will now work for TAAJ Croisières. This will effectively double Rivages du Monde’s ocean cruising numbers to about 12,000 passengers, almost the same as their river business. 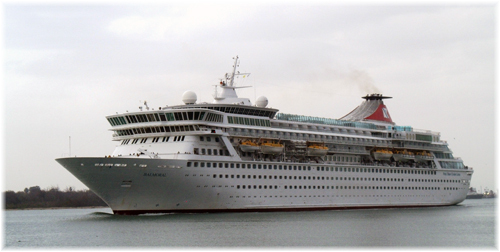 TAAJ handled about 8,500 ocean cruisers last year but had booked as many as 14,000 in previous years. Note: Louis Cruises intends to introduce a new brand for its Greek-based cruise ships, the Louis Cristal and Louis Olympia. Details will be announced next month but the name will be Celestyal Cruises. This does not so far include the Louis Aura. In September 2011 came a report that Xiamen Shipbuilding Industry Co Ltd would build a 100,000-ton cruise ship for $234.5 million, thought at the time to be low. By July 2012 this had risen to 490 million, and delivery of the ship, to be named China Xiamen, had now been put back from 2014 to October 2018. There were also reports, later denied by Royal Caribbean, that it was involved in an advisory capacity, and that two of the world’s most eminent naval architects, Stephen Payne, designer of the Queen Mary 2, and Deltamarin, the Finnish ship designers, were involved in the project. The Shanghai-based Shan Hai Shu Group, a conglomerate with a cruise tourism development partnership with Royal Caribbean International, would supposedly operate the China Xiamen through a subsidiary, Xiamen International Cruise Co Ltd. But now Cruise Industry News has reported that Xiamen Shipbuilding has dropped plans to build its 100,000-ton cruise ship. This comes close on the news that the Titanic II will likely be another cruise ship that will not be built in China.